AV41. 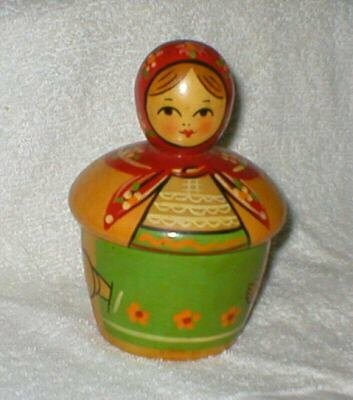 Unusual USSR Doll Box 5.4"
This is not a nesting doll, but it does open. Doll is a box or dish with a tight fitting lid. The doll measures approx 5.4 inches high, and is in very good condition, no cracks, chips, or damage. Doll's age is unknown.